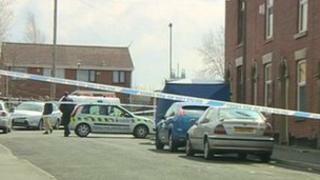 A man has been charged with the murder of a woman who was stabbed in Oldham, Greater Manchester. Farkhanda Younis, 30, who was known to family and friends as Jabeen, was discovered at a house in Bamford Street, Chadderton, on 19 April. Police have said Ms Younis's seven-year-old son was found in the Bamford Street property when his mother's body was discovered. Jahangir Nazar, 34, of Bamford Street, Chadderton is charged with her murder. He is due to appear at Oldham Magistrates Court on Friday. A 20-year-old woman who was arrested on suspicion of murder has been bailed until May pending further inquiries.